This is the Complex 21 launch structure (also known as the "hardsite") at Complex 21/22. To the northeast of the hardsite is the Complex 22 "soft site" which is essentially space for a mobile launcher. The hardsite contains two launch bays (21-1 and 21-2). The pipes you see extending from the launch bays are exhaust tubes. The two-story building to the right houses the Launch Control Center. 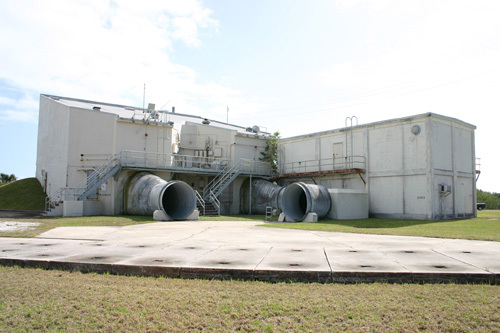 This Complex was built in 1956 to support launches of the Air Force Mace and Bull Goose missiles. The first launch took place from this site on July 24, 1958. In 1959, the Complex was rebuilt (adding the hardsite) to support launches of the newer Mace missile. The first Mace missile was launched on July 11, 1960 and a total of 44 launches were performed until the last one on July 17, 1963. The complex remained inactive until its dismantlement in the early 1970's. The photo of the hardsite above was taken in 2005. It has been refurbished since my visit in 1996.